The wings of the Speedwing™ automatically angle forward or back, based on blade position, to maximize plowing efficiency. When angled for windrowing, the trailing wing folds back in line with the moldboard, while the leading wing retains its forward position to capture more snow, reduce spill-off, and allow use of the entire blade. 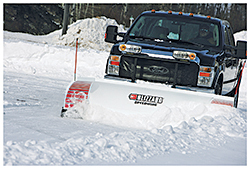 Operators can use the multi-position plow as a straight blade.